Moore Mineral video from Thomas Moore Feed. 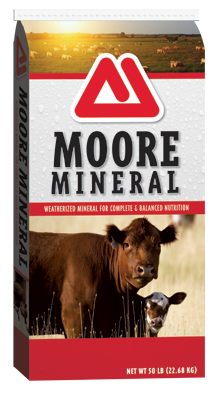 Moore Mineral is a weatherized mineral for complete and balanced nutrition in breeding and stocker cattle. The mineral is comprised of coarse, granular particles treated with a petrolatum coating to seal out air and moisture, protecting vitamins and preventing nutrient loss. Products are targeted for a consumption of 4oz. (0.25lb) per head per day. No additional salt is required. Moore Minerals provide a complete vitamin and mineral package to support health, breeding, and reproductive performance. Calcium, phosphorus, magnesium and potassium are provided at levels based on seasonal needs. All products in the Moore Mineral line provide a high-quality trace mineral package comprised of multiple sources (amino-acid chelates, chlorides, and sulfates) in order to maximize absorption and utilization. Moore Mineral Dormant Forage – This product is intended to serve as a fall and winter mineral but may be used any time when cattle are grazing low quality forage. P10 provides a higher level of phosphorus for cattle on mature or dormant pasture or cattle being fed hay. Additionally, potassium and some trace minerals are provided at higher levels to fill in gaps in the nutrient profile of lower quality forages. Moore Mineral Green Grass – This product provides a more moderate level of phosphorus for cattle grazing green forage in spring and summer. The higher calcium and lower phosphorus in P7 (2:1 ratio) may also be a more appropriate choice in winter if cattle are being supplemented with grain by-products that are naturally high in phosphorus. Moore Mineral Fly Control – This is the same formula as the standard version of Moore Mineral P7 with the addition of Altosid® IGR to reduce horn fly numbers in beef cattle on spring and summer pasture. Altosid® IGR is a feed-through fly control that is inert in the animal but interrupts the breeding cycle of flies in manure. Moore Mineral Hi-Mag – This is a mineral designed for cattle grazing lush pastures in early spring or green cereal crops during winter. These types of forages are often deficient in magnesium, potentially resulting in grass tetany in cattle. The 10% magnesium, as well as high calcium and low phosphorus, provide the necessary minerals to compensate for these deficiencies.